Corfe Bears > Charlie Bears > MINIMO POCKET 7"
She is part of the "THE BEST THINGS COME IN SMALL PACKAGES" SERIES, which also includes LOCKET and YOYO. POCKET MINIMO is one of the new additions to the mini series called "BEST THINGS COME IN SMALL PACKAGES", which was started in 2018. This set consists of small mohair bears and the attention to detail on them is amazing. Pocket is made from slightly sparse but fluffy, silvery grey mohair and she has a small dark grey hand-stitched nose and mouth, twinkly black eyes and cute dropped ears. 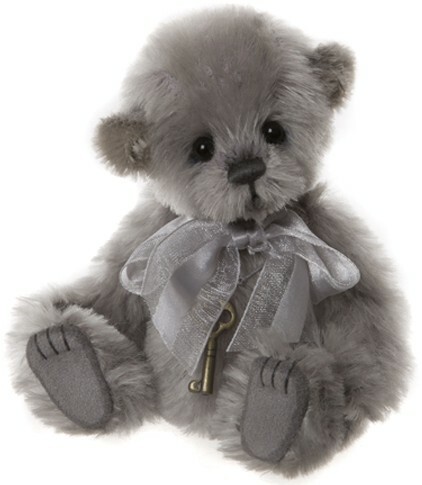 She has stitched paws and wears a glittery silver ribbon and a key pendant. Pocket Minimo is a fully-jointed, miniature mohair bear from the Charlie Bears 2019 Minimo Collection.